I've always liked the combo of pink and green in my journal. Green brings the balance and harmony and pink brings life and fun to the party! 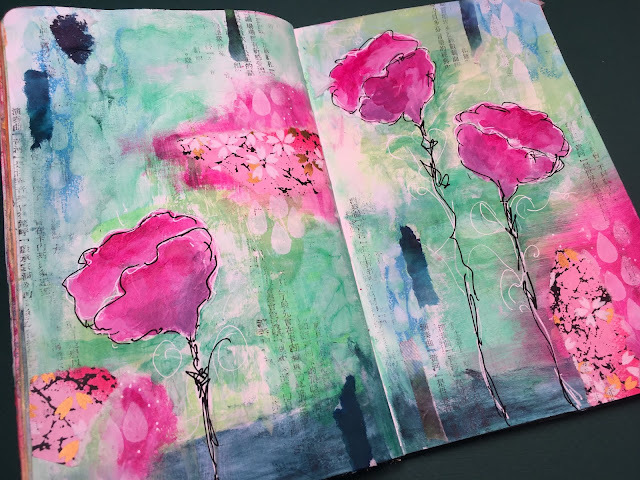 I was feeling a bit lethargic before journaling, but these pages certainly perked me up! A green background was covered with areas of blue gelato and pink paint/paper peaking thru. The flower shapes were painted in white before the pink was added to really make them pop. You'll even see hints of rain on the page because it's still raining in the Northeast! Strips of paper and Posca paint pens in white and black help add finishing details.